INCLUDES A SNEAK PEAK OF JON LAND'S THRILLING NEW CAITLIN STRONG NOVEL, STRONG AT THE BREAK, AVAILBLE IN JUNE! Five years later, Caitlin is still trying to purge herself of guilt from the day that ended her Ranger career. But a shattering discovery will reopen old wounds, and Caitlin's renewed investigation into the truth behind the bloody desert firefight uncovers a terrifying plot that reaches into every home and threatens the very core of the country. Caitlin's tormented quest for redemption takes her to a dark world, ranging from Washington to Bahrain to the wastelands of Mexico, as she finds that the strength to live comes from learning how to die. 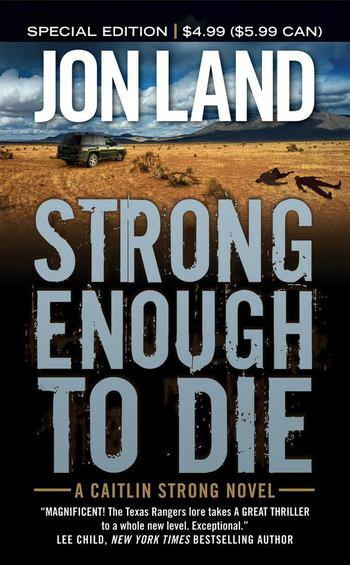 Jon Land is the acclaimed author of numerous bestsellers, including The Seven Sins, The Last Prophecy, Blood Diamonds, The Walls of Jericho, The Pillars of Solomon, A Walk in the Darkness, Keepers of the Gate, and The Blue Widows. He lives in Providence, Rhode Island.